In today’s competitive music market there is no room for bands to rest on their laurels and Sussex based Hatful of Rain understand the importance of connecting with both their existing and potential fan base. Praise has been showered on the quartet following their debut release, including a successful session with Bob Harris, but the recording of a new album could just be the impetus they need to take their music to a wider audience. Along with this excellent sophomore album, the band that produce an eclectic roots sound to excite specialists in the country, folk and Americana scene, are also in the throes of breaking out from their south coast zone with a tour of venues further afield. The good news is that in THE MORNING KEY they have a record to carry on the momentum. Under the guidance of the good folks at the Union Music Store and leadership from producer Al Scott (The Levellers, Oysterband), this 13 track comprehensive collection of self-penned songs shows the democratic approach to music making the band have and how well they utilise their musical and vocal talents. All four band members have contributed to the writing process and in their own individual style shape the sound with waves of fine musicianship. The beautiful choral-like vocals of Chloe Overton grace the majority of the tracks and she also supplies string input in the guise of banjo, mandolin and guitar. Phil Jones drives the band along with his onstage enthusiasm, double bass, banjo and guitar contribution as well as lead vocal on ‘Bread Woolly Back’ and additionally, playing a significant part in raising the band’s profile. Although the quality rarely dips during the album’s 52 minute play time, there is an undeniable high early in the listening with the outstanding ‘Good Way (To Make a Bad Man Worse)’ and the inspirational ‘One Promised Land’. The opportunity to experience these songs live is a mouth-watering prospect. The opening track ‘These Streets’, lifted as the first single, and ‘Map or Compass’ embed the bluegrass sound in the band which is further enhanced by the regular contributions of Fred Gregory and James Shenton. Gregory, also a member of likeminded group Porchlight Smoker, excels on mandolin, guitar and double bass as well as singing and writing the twin tracks ‘Superman’ and ‘Stay’, the latter a duet with Chloe. Shenton provides the essential fiddle sound which weaves its way through the tracks peaking with ‘Stranger’, an instrumental he composed. The album also benefits from a number of guest musicians including John Breese, who was seen live recently playing banjo with The Coal Porters, and Max Sweatman, the source of the hurdy-gurdy sound added to the stompin’ finale ‘Little Bird’. With such a positive and upbeat ending, you are left with little alternative but to press repeat and re-live all the many high spots again. Hatful of Rain are just about to undertake their most extensive tour to date and when you add the best of THE MORNING KEY to old favourites ‘Way Up On The Hill’, ‘Rockin’ Chair Daddy’ and ‘Angelina Baker’ from the first album then the opportunity to catch them live is a must. 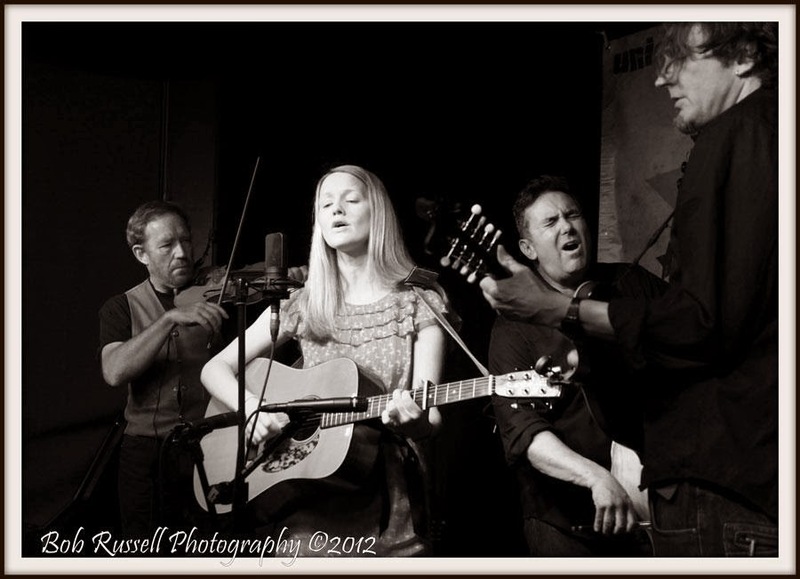 If Hatful of Rain are the barometer of the UK folk/roots/Americana scene, then the future looks safe and secure.